INDUSTRY.co.id - Temanggung - C-grade dried tobacco shoots in Temanggung Regency, Central Java (Central Java) during this year's harvest is purchased at Rp75.000 per kilogram by the manufacturer. Head of Legoksari Village, Tlogomulyo Sub-district, Subakir said the price is much higher than last year's harvest, which is for grade C Rp40.000 per kilogram. "The price is in accordance with the quality of tobacco this year is good, if the harvest last year there was no good quality tobacco because the weather does not support, which happens continuing rain," he said in Temanggung, Saturday (02/09/2017). According to him, the weather during the current tobacco harvest is good, dry conditions that help in the process of tobacco drying. "Hopefully this kind of weather will last until the tobacco harvest is over so that it can emerge a grade of tobacco on top of which the price will be more expensive," he said. Meanwhile, the Secretary of Indonesian Tobacco Farmers Association (APTI) Agus Setyawan also admitted that the quality of tobacco this year is much better than last year's harvest. 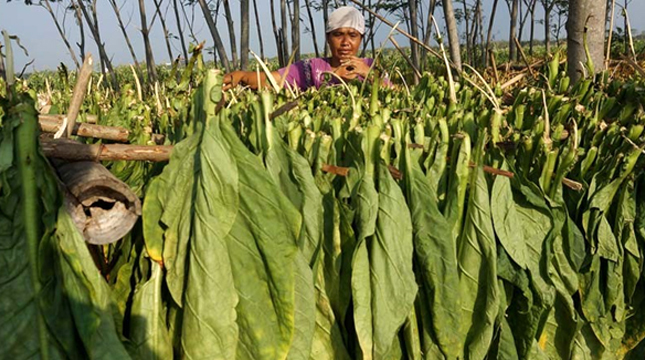 "As a result of the tobacco harvest last year, the area of ​​tobacco land in Temanggung this year fell about 35% of last year's land area of ​​about 19,000 hectares," he said. Agus explained the reduction of tobacco plant area this year especially in the rice fields and partly in the moor area planted with chili. "However, knowing the current good tobacco and the possible behavior of tobacco area next year will increase again," he said. Agus said for the area of ​​Mount Prahu tobacco harvest has started since the end of July 2017 and now the harvest has reached 50%.